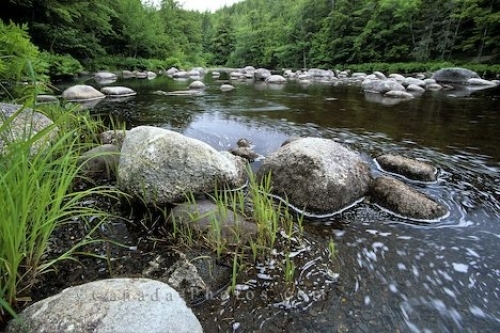 Lush green wilderness encompasses the Mersey River flowing through Kejimkujik National Park in Nova Scotia, Canada. In early years, the Mersey River in Nova Scotia was a means of transportation for the First Nations people known as the Mi'kmaq and then it became a way to ship logs out of the Province. Today people who visit Kejimkujik National Park enjoy canoeing, fishing, swimming, hiking or sightseeing around the Mersey River in Nova Scotia, Canada. Picture of the Mersey River flowing through Kejimkujik National Park in Nova Scotia, Canada.